This past Wednesday Apple made their September music announcement at the Yerba Buena Center in San Francisco. In typical Steve Jobs fashion this presentation was a three act play. First getting, the numbers out of the way quickly, he announced Apple retail is doing well with 300 stores worldwide. The second stores in China and France just opened to huge fanfare as well as a new store in London. Ten countries now have Apple Stores and soon to be eleven with a new store opening in Spain. Some days these Apple Stores are seeing over 1 million visitors in a single day. Over 80,000 one to one classes are being held every week and over half of the new Mac buyers are first time buyers. The First Act of Steve’s three act play was to discuss iOS. Over 120 million iOS devices have been shipped since the iPhone was introduced in 2006. Currently Apple is activating 230,000 iOS devices per day. These devices have downloaded 6.5 billion apps from the app store, about 200 apps per second. This week Apple will be rolling out iOS 4.1 for iPhone and iPodTouch. The new version fixes issues with the proximity sensors solving problems users have had when holding the phone up to their face. This release is also correcting issues with Bluetooth connectivity. Also some enhancements have been included to solve some iPhone 3G performance problems. I have been running this for the last week on my iPhone and the Proximity Sensor is fixed. I haven’t noticed any issues with my bluetooth so I will have to talk to some other people on that. I have heard online that 3G performance improved a little bit. Some new features that have been added to iOS 4.1 are HDR (High Dynamic Resolution) photos. This is the first camera phone to support this feature. Only a few pocket cameras have even started including this technology. When you shoot a photograph where you have sky and shadow a normal digital photo will blow out the lighter part of image and the dark parts will just show as black. With HDR the camera will take three pictures quickly one with the exposure it thinks is correct and one an F-Stop higher, and another an F-Stop lower. Then the software will blend the three images to create a single photo that displays all three images in a balanced way revealing details that couldn’t be seen before. This is an exciting new technology and one that, in my testing, I have been impressed with. HDR doesn’t work with action shots or where the scene is changing rapidly and parts of the image that are in motion while photos are being taken tend to blur. So if you are taking pictures of moving people or objects turn HDR off. If you are shooting a still scene or one with little motion by all means use it. Apple has no added the ability to upload HD videos over WiFi so now you can shoot, edit, and upload video to You Tube right from your iPhone. TV Show rentals have also been added to the iTunes Store on the phone. So if you are heading out for a flight, or to catch a train and you missed last nights episode of Eureka you can rent it right on your phone and watch it on your trip. We also now have Game Center, a social gaming platform for the iPhone. Currently the iPod Touch has over 50% of the portable gaming market and this coupled with the Unreal Game engine coming to the iPhone this winter is just going to grow that gap even further. Now people can challenge their friends and see what they are playing online through the Game Center app or in any Game Center enabled game. Game Center is on the iPhone, iPod Touch, and later this fall the iPad. iOS 4.1 for the iPhone and iPodTouch will be available later this week. Apple also gave us a sneak peak at iOS 4.2 coming in November. This will bring multi-tasking, Game Center, Folders, HDR photos, message threads, unified inbox, and wireless printing to the iOS. I have head other people commenting this must mean that iPad is getting a camera. While I have no doubt Apple will someday add a camera to the iPad I wouldn’t look for it before next April. I believe iOS 4.2 just brings iOS for the iPhone and iPad together so they can start releasing one OS for both. iOS 4.2 will give us printing from our iPad and iPhones, so if you wish to print a document just click on Print, and tap the Bonjour printer in range you wish to print your document on. iOS 4.2 is also going to bring us a new technology called Airplay. Airplay will allow us to stream movies, TV shows, or music from our iOS device to an Apple TV but more about that a little later. In Steve’s second act he announced their have been over 275 million iPods sold and an entirely new line of iPods are being introduced this week. The shuffle got its click wheel back and kept voice over and its clip to make it wearable with 15 hours of battery life and comes in five colors for $49.00. He never said in the keynote but I assume it is still 1 Gig of storage. The iPod Nano gets a total facelift making it nearly half the size and weight. Apple did away with the click wheel and replaced it with a small multi-touch display and the new nano appears to be running at least a stripped down iOS. It makes me wonder if the iPod apps will reappear at some point for the Nano. The Nano also dropped its camera and video recording capabilities in favor of the much smaller size. Also included in the new Nano is an FM Radio, pedometer, Nike +, and a battery that boasts 24 hours of music play back. It doesn’t appear they included an accelerometer either to determine which direction is up as the screen doesn’t rotate on its own. It requires the user to make a multi touch twist motion on the screen to set the orientation. The new Nano comes in an 8 gig form factor for $149 and 16 gig for $179. Last in the line up is the new iPod Touch. The iPhone without a contract. iPod Touch is being updated to include a new retina display just like the iPhone. The unit is thinner has Apple latest A4 chip in it. A 3 axis gyro was added for more accurate game play and a front facing camera for FaceTime video conferencing. Also an HD camera on the other side for recording and uploading HD video. Now iPod Touch and iPhone users can call each other using FaceTime over a WiFi network. The new touches will come in 8 gig for $229, 32 gig for $299, and 64 gig for $399. Also in the area of music Steve announced iTunes 10. First thing I noticed that is missing from iTunes 10 besides color is it still isn’t 64 bit for the Mac, and Apple has not given us a brilliant Apple like way of managing the content on our devices. This was the one thing that was and is still sorely lacking in iTunes. What we did get is apparently faster syncing with our devices. My iPad takes half the time to sync up as before. The iPhone has always been fairly quick but it even got faster. Since digital downloads are poised to overtake CD sales this year the CD has been dropped from the logo and now we have a music note on a blue background. It looks nice in the dock but makes the other icons around it start to look a little dated. The new hybrid view is a great way to look at your music and see album art for albums where you have more than five songs and it takes up no more space. The view is nice and I will probably start using it as my default view. Also new to iTunes Apple’s foray into Social Networking with Ping. If you want to follow me on Ping and see what I am listening to just click here. It is like Twitter or Facebook but dedicated to music. This may be Apples way of sticking their toe into the Social Networking water. 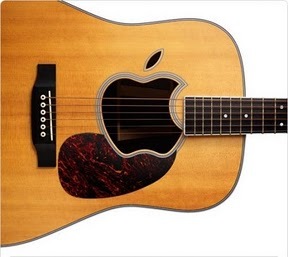 If the music social networking goes well perhaps Apple will expand ping to be a direct competitor to Facebook. And as a third act Steve talked about Apple’s hobby. AppleTV is now smaller, cheaper, and easier to manage. AppleTV was introduced in 2006 and was not a big hit. It wasn’t what the main stream user was looking for. The average user doesn’t want to think about syncing their device. So the new Apple TV doesn’t have any storage on board and no way to buy new movies or TV shows. Currently the Apple TV is rental only. $0.99 for HD TV shows and $4.99 for HD first run movies and the price goes down for movies as time goes on. Also Apple TV can stream content from any computer with iTunes on the network. It is equipped with HDMI, Ethernet and 802.11n wireless and comes with an aluminum Apple remote control. Streaming of Netflix and YouTube has also been added to the new AppleTV. Also with the new Airplay feature coming in iOS 4.2 you will be able to stream content from your iPhone or iPad to your Apple TV device at the touch of a button. This still gives users who want to buy a movie or TV show the ability to buy on the iPad and download it, then watch on the Apple TV. The one question I have is will Quicktime X see an Airplay feature added? I have already placed my pre-order so I will have an in depth look at the new Apple TV when it arrives. Many people were expecting a TV revolution this week that didn’t seem to come. There was no mention of the North Carolina datacenter and what it will be used for later this year and we still haven’t heard when FaceTime will be coming to iChat. There was no mention of apps on the AppleTV or a streaming TV show service. I would love to download apps for the channels I watch and just pay for the channels I like instead of everything. Apple can revolutionize TV just like they did with music and multi-touch applications on smart phones. But they apparently have decided to a take a slow steady approach.